I looked through the popular courses and found some amazing courses that will help boost your career and expand your knowledge. Check them out, and start enrolling today! 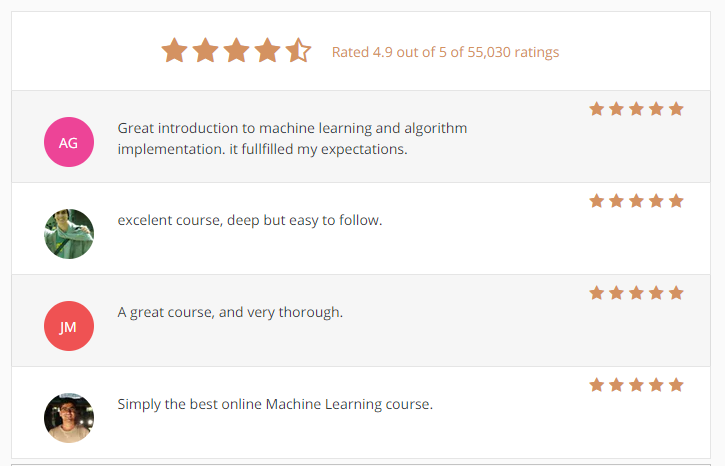 This course provides a broad introduction to machine learning, datamining, and statistical pattern recognition. Topics include: (i) Supervised learning (parametric/non-parametric algorithms, support vector machines, kernels, neural networks). (ii) Unsupervised learning (clustering, dimensionality reduction, recommender systems, deep learning). (iii) Best practices in machine learning (bias/variance theory; innovation process in machine learning and AI). The course will also draw from numerous case studies and applications, so that you’ll also learn how to apply learning algorithms to building smart robots (perception, control), text understanding (web search, anti-spam), computer vision, medical informatics, audio, database mining, and other areas. In this class, you will learn about the most effective machine learning techniques, and gain practice implementing them and getting them to work for yourself. More importantly, you’ll learn about not only the theoretical underpinnings of learning, but also gain the practical know-how needed to quickly and powerfully apply these techniques to new problems. Finally, you’ll learn about some of Silicon Valley’s best practices in innovation as it pertains to machine learning and AI. Deep learning engineers are highly sought after, and mastering deep learning will give you numerous new career opportunities. Deep learning is also a new “superpower” that will let you build AI systems that just weren’t possible a few years ago. In this course, you will learn the foundations of deep learning. 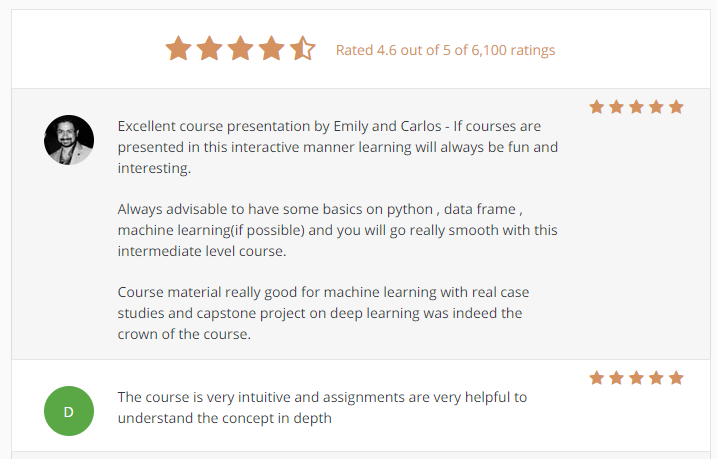 This course also teaches you how Deep Learning actually works, rather than presenting only a cursory or surface-level description. So after completing it, you will be able to apply deep learning to a your own applications. If you are looking for a job in AI, after this course you will also be able to answer basic interview questions. This is the first course of the Deep Learning Specialization. This course will teach you how to build convolutional neural networks and apply it to image data. Thanks to deep learning, computer vision is working far better than just two years ago, and this is enabling numerous exciting applications ranging from safe autonomous driving, to accurate face recognition, to automatic reading of radiology images. Understand how to build a convolutional neural network, including recent variations such as residual networks. Know how to apply convolutional networks to visual detection and recognition tasks. Know to use neural style transfer to generate art. Be able to apply these algorithms to a variety of image, video, and other 2D or 3D data. This is the fourth course of the Deep Learning Specialization. 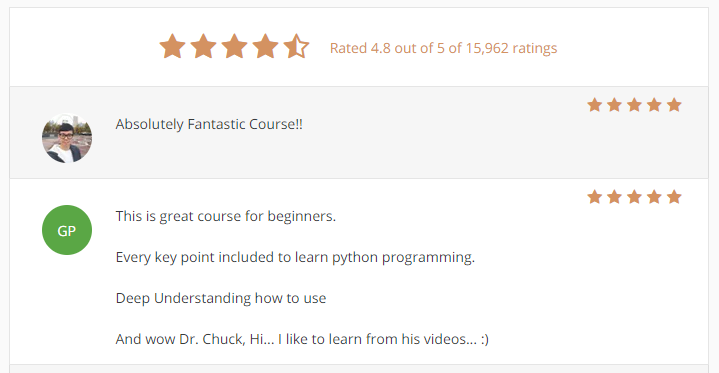 This course will introduce the learner to the basics of the python programming environment, including how to download and install python, expected fundamental python programming techniques, and how to find help with python programming questions. The course will also introduce data manipulation and cleaning techniques using the popular python pandas data science library and introduce the abstraction of the DataFrame as the central data structure for data analysis. The course will end with a statistics primer, showing how various statistical measures can be applied to pandas DataFrames. 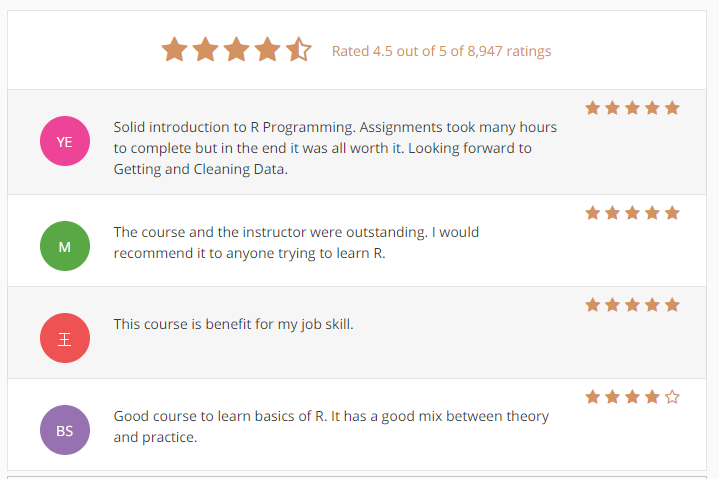 By the end of the course, students will be able to take tabular data, clean it, manipulate it, and run basic inferential statistical analyses. 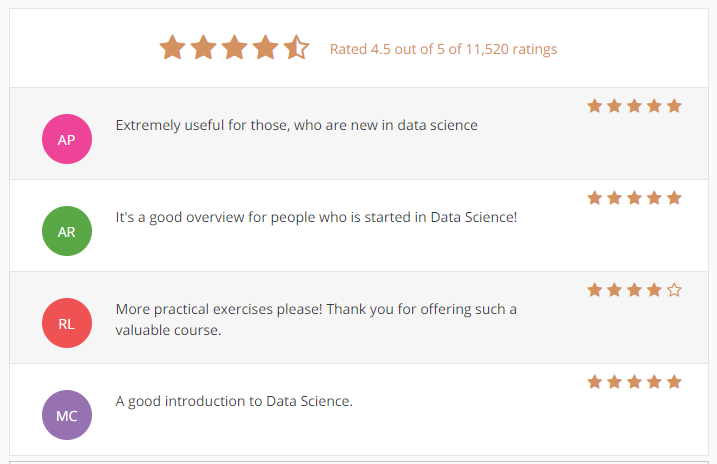 This course is part of “Applied Data Science with Python“ and is intended for learners who have basic python or programming background, and want to apply statistics, machine learning, information visualization, social network analysis, and text analysis techniques to gain new insight into data. Only minimal statistics background is expected, and the first course contains a refresh of these basic concepts. There are no geographic restrictions. Learners with a formal training in Computer Science but without formal training in data science will still find the skills they acquire in these courses valuable in their studies and careers. This course will introduce the core data structures of the Python programming language. We will move past the basics of procedural programming and explore how we can use the Python built-in data structures such as lists, dictionaries, and tuples to perform increasingly complex data analysis. 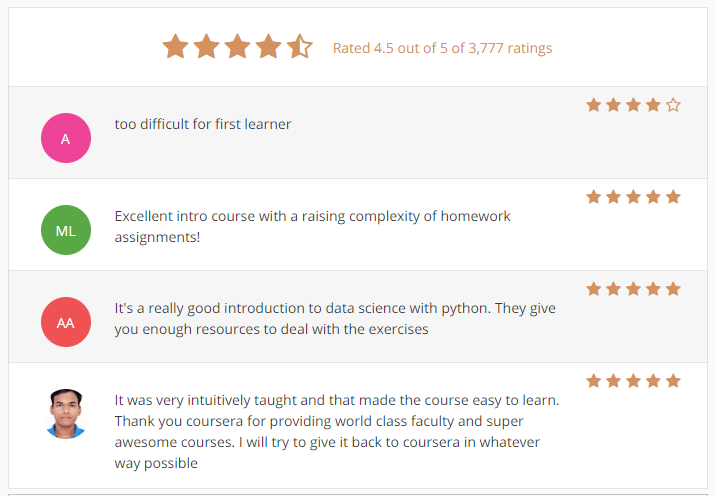 This course will cover Chapters 6–10 of the textbook “Python for Everybody”. 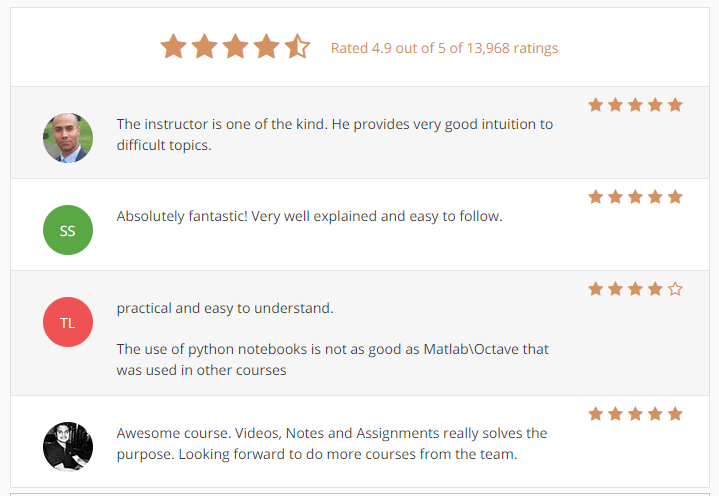 This course covers Python 3. 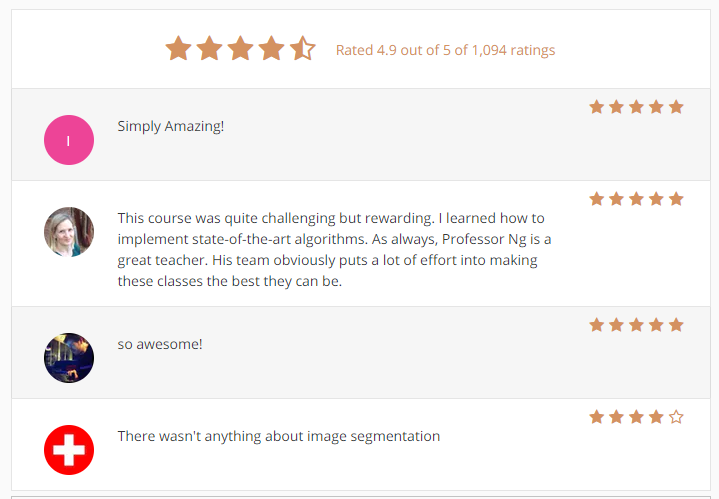 Programmers with basic experience looking to understand the practical and conceptual underpinnings of algorithms, with the goal of becoming more effective software engineers. Computer science students and researchers as well as interdisciplinary students (studying electrical engineering, mathematics, bioinformatics, etc.) aiming to get more profound understanding of algorithms and hands-on experience implementing them and applying for real-world problems. Applicants who want to prepare for an interview in a high-tech company. In this course you will discover the elements of the functional programming style and learn how to apply them usefully in your daily programming tasks. You will also develop a solid foundation for reasoning about functional programs, by touching upon proofs of invariants and the tracing of execution symbolically. The course is hands on; most units introduce short programs that serve as illustrations of important concepts and invite you to play with them, modifying and improving them. The course is complemented by a series programming projects as homework assignments. Identify potential applications of machine learning in practice. Describe the core differences in analyses enabled by regression, classification, and clustering. Select the appropriate machine learning task for a potential application. Apply regression, classification, clustering, retrieval, recommender systems, and deep learning. Represent your data as features to serve as input to machine learning models. Assess the model quality in terms of relevant error metrics for each task. Utilize a dataset to fit a model to analyze new data. Build an end-to-end application that uses machine learning at its core.